Since 1958, Bradley Paving has specialized in providing quality paving services for residential and commercial purposes. For all of your parking lot, driveway and asphalt patching needs, call the family owned and operated paving professionals at Bradley Paving for a free estimate. 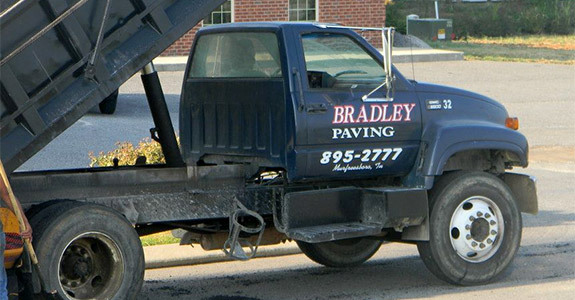 When you’re looking for a local company to handle a residential or commercial paving job, contact Bradley Paving. As a family owned and operated business, Bradley Paving has been providing long-lasting, high-quality asphalt paving in Murfreesboro, TN since 1958. We’re able to handle a wide variety of jobs, and we’ll even provide a free estimate so you understand what you’ll be getting for your money. We know you have choices when you need a driveway repaved or a new parking lot put down. That’s why our aim is always to make sure Bradley Paving offers competitive rates and quality work, providing every service we offer with a smile. We offer thorough and long-lasting asphalt residential and commercial paving services. Our equipment and products are of the highest quality. We can make an old, damaged driveway or parking lot look better than ever. We’ve been a proud family owned and operated local business since 1958. Our prices are competitive and transparent, and we offer free estimates. "First off, they were so patient with me, Mr. Bradley came out to give an estimate and explained the process and showed me where they would p..."
"Between neglecting to properly maintain our long driveway and intrusive tree roots, our asphalt driveway was indeed a mess! After receiving..."
"Great Job. .... they listened to what I wanted..& they did that + more the price was Fair. .& the Workmanship Was. . Beyond (Good Job) it wa..."
"They are the nicest and caring people. They did everything I asked. Returned every phone call. Did the job right and just like we asked. Cam..."
"These guys did an amazing job on our driveway. A true professional. Did everything we asked and then some. Show up when they said they would..."